During those times I'm not sick of the sound of my own voice, I can be heard proclaiming "If something is X, it has to *BE* X." Bonnie Nadzam is an author who understands this and I salute her for it. 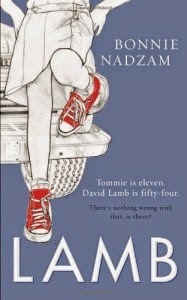 The pacing of Lamb's (character) reveal is done brilliantly and although I had criticisms at first, the character paid off. There are moments where credibility should be stretched, but it works for me because the characters have fidelity. That said, I did have a few problems with this. Although ostensibly written in omni, little is made of it and it feels like a convenience for those few moments it *is* made use of. I also feel - because it's omni - a greater sense of the long term picture could have been given, rather than the brief paragraph we get. Dave Lamb *is* X, so there's going to be more than just this story. I was also mention I was surprised to see another reviewer describe this as a love story if we think out of the box. It isn't. It really, really, isn't. It is, however, a great one to give to your teenage daughter, along with a highlighter pen. This is a really well written and intelligent book which deserved its Women's Prize for Fiction Longlisting although it's definitely not one for everybody: four stars.